On it's opening weekend I saw Coraline and this past Sunday I saw Watchmen. Been a bit too busy to post about either one. 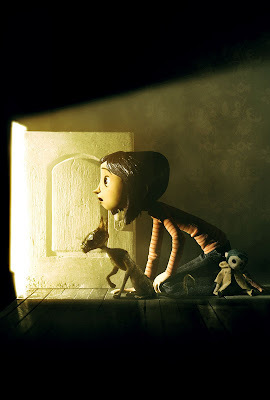 Coraline is gorgeous. It's hard to think of too much else to say.... It was just stunning. I loved the animation, the design, the sets... My jaw dropped when all those mice started a choreographed dance in the other world... I noticed the lighting and little details in the kitchen of the real world as soon as the camera cut there, how stark grey and depressing it was... I could feel the uselessness Coraline felt in that world... And when compared to the warm and perfect inviting kitchen of the other world... How inviting it seemed. I had read the book ages ago... So there was a good amount of time between the reading and the viewing. I thought it was a perfect story for the stop motion animation medium. Check out some more artwork by Shane Prigmore here with links to other artists on his blog. 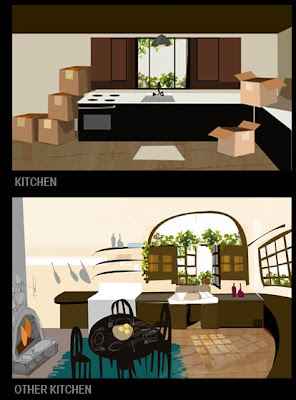 Some Corline artwork by Jon Klassen at his blog and website. Check out these Coraline Boxes! 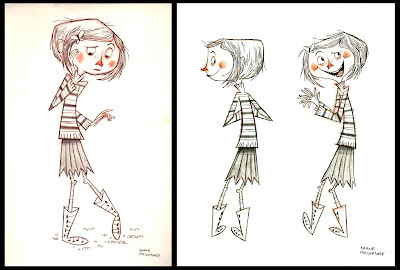 Here's a cool Coraline blog called Evil Buttons. Dammit... 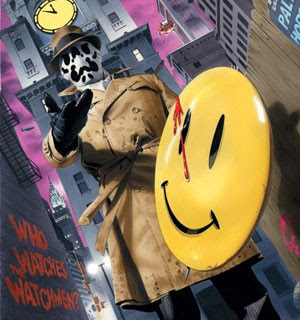 I read a way better review of Watchmen a few days ago but I can't find it anywhere... That review was basically saying this: Three of the main characters, Rorschach, Doctor Manhattan and The Comedian all have certain negative or neutral opinions about the state of humanity. The Comedian gets humanity and sees it as a joke, Rorschach sees unjust acts everywhere and had a terrible upbringing, he wants to bring justice and doesn't go for forgiveness and Dr. Manhattan, while not devoid of emotion, has little opinion on human life. He since human life as one eyeblink compared to the vastness of existence. It lives, it dies. Out of so much negativity is born two certain people, Silk Spectre II and Nite Owl who fall in love. One message of the movie is that it's possible to find things worth saving in a world so twisted. Hm. When I went to Mike Scott's blog homepage, I noticed he has a post devoted to cute animals. There is a photo of a kitten with it's paw on a baby chicken. 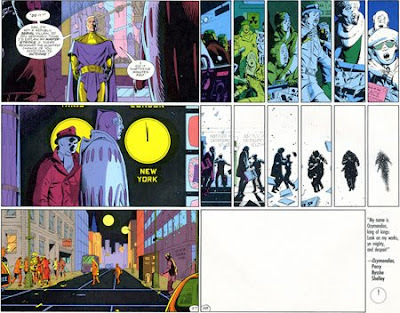 Some further reading on the making of Watchmen.